1 full time auxiliary opportunity until October 2021. An eligibility list may be established. The BC Prosecution Service is seeking a Legal Assistant for the After Hours Bail Team in Kelowna. Due to the nature of the After Hours Bail Team, the hours of work required fall on Weekends and Statutory Holidays that fall during their work schedule, including Christmas Day and Boxing Day. Staff working on Statutory Holidays will be entitled to additional compensation and day(s) off in lieu, consistent with the BCGEU Master Agreement. Contribute to the administration of justice in a diverse legal environment by bringing your thoroughness, good judgement and initiative to this specialized role. The BC Prosecution Service contributes to the protection of society by preparing for and conducting prosecutions diligently and fairly. BC Prosecution Service prosecutes offences under the Criminal Code of Canada, the Youth Criminal Justice Act and provincial statutes in the provincial, Supreme and Appeal Courts of British Columbia and in the Supreme Court of Canada. The BC Prosecution Service provides legal advice to government and police on criminal law matters and develops policies and procedures on issues relating to the prosecution of criminal justice. As a Legal Assistant, you provide administrative and secretarial services to Crown Counsel. The Legal Assistant receives administrative supervision from the Legal Office Manager, District Administrator or Deputy Director Regional Operations and reports to Crown Counsel for daily assignments and direction. Your ability to deal with issues of a sensitive and confidential nature with tact, diplomacy and good judgement will prepare you to work effectively in a demanding environment where criminal cases are managed. You are well versed in legal terminology, an accurate and efficient information recorder and researcher and adept at handling inquiries from a variety of persons, including those that are possibly irate or resistant. Working with limited direction, you exhibit exceptional organizational, verbal and written communication skills, and the ability to build and maintain productive working relationships with key stakeholders. If you are seeking to gain valuable experience to advance your administrative career in a dynamic environment, we look forward to your application. The BC Public Service is an award winning employer and offers employees competitive benefits, amazing learning opportunities and a chance to engage in rewarding work with exciting career development opportunities. For more information, please see What We Offer. The BC Public Service is committed to creating a diverse workplace to represent the population we serve and to better meet the needs of our citizens. Consider joining our team and being part of an innovative, inclusive and rewarding workplace. The BC Public Service is an inclusive and accessible employer. Please advise the hiring manager if any accommodations are required to assist you to ensure equitable participation. For complete details about this opportunity, including accountabilities, please refer to the attached job profile. For specific position related enquiries, please contact Stacey.Allan@gov.bc.ca. DO NOT SEND YOUR APPLICATION TO THIS EMAIL ADDRESS . For more information about how to create or update your profile and how to submit your application, please refer to the Job Application page on the MyHR website. If you are still experiencing technical difficulty applying for a competition, please send an e-mail to BCPSA.Hiring.Centre@gov.bc.ca, before the stated closing time , and we will respond as soon as possible to assist you. NOTE: Applications will be accepted until 11:00 pm Pacific Time on the closing date of the competition. Job Requirements: In order to be considered for this position, your application must clearly demonstrate how you meet the education and experience as outlined below: Secondary school graduation or equivalent, and successful completion of a recognized legal assistant program or paralegal program or a combination of 4 years of education, training and administrative support/clerical experience. 6 months of experience working in a legal office. Preference may be given to applicants with the following: Experience within the last two years working in a legal office. Experience working as a legal assistant in the criminal law field and/or the Justice Sector. Applicants selected to move forward in the hiring process may be assessed on the Knowledge, Skills, Abilities and Competencies as outlined in the attached Job Profile located in the Additional Information section at the bottom of the posting. Enhanced Security Screening will be required, which may include a Criminal Records Review Act (CRRA) check. APPLICATION REQUIREMENTS: Cover Letter: NO - Please do not submit a cover letter as it will not be reviewed. Resume required: YES - Ensure your resume includes your educational accomplishments, employment history including start and end dates (month and year) of your employment, and any relevant information that relates to the job to which you are applying. Questionnaire: YES - As part of the application process, you will be prompted to complete a comprehensive online questionnaire to demonstrate how you meet the job requirements. Please allot approximately 60 minutes to complete the questionnaire. IMPORTANT: Comprehensive questionnaire responses will be used to shortlist applicants against the job requirements. Please ensure you include all relevant information about your educational accomplishments and employment history including job titles, start and end dates (month and year) of your employment, and your accountabilities and accomplishments. 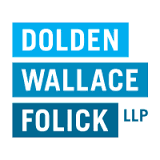 Dolden Wallace Folick LLP was created with the sole objective of providing legal services exclusively to the insurance industry. Our firm is an industry leader in terms of expertise and experience. We defend insureds under property, liability, and a wide variety of specialty insurance lines. We also provide coverage and underwriting advice to national and international insurers, and pursue subrogated claims on their behalf. Dolden Wallace Folick LLP has repeatedly been recognized as one of the top Insurance Defence firms in Canada, with offices in Vancouver, Kelowna, Toronto and Calgary. We offer a dynamic and challenging work environment that provides you with the opportunity to make decisions and influence results. We are committed to creating an inclusive work environment that values, respects and supports different perspectives, cultures and experiences. If you are interested in making your mark and contributing to the overall success of a team, this is a perfect time to apply. Our Firm continues to grow so we are searching for a talented Litigator to join our Kelowna team. The successful candidate will have: 2-7 years of experience in litigation A license to practice in BC Demonstrated commitment to client service Admirable interpersonal skills Analytical and reasoning capabilities This opportunity offers exposure to a wide variety of interesting and sophisticated matters. If you have a desire to work with leading lawyers in insurance defence, please forward your application. We are a full service firm in the B.C. interior, and we are seeking a litigation lawyer to join our experienced team. The successful candidate will handle a varied practice in general, commercial and personal injury litigation within our well-established firm. Strong organization skills, an attention to detail and good communication and interpersonal skills are essential qualifications of the successful candidate. The firm offers an excellent compensation package which includes a bonus program and group insurance plan benefits including dental and extended medical. Please forward your resume, along with a covering letter, to the attention of Neville McDougall.